Vanessa graduated from Winchester School of Art in 1993 with a First Class Honours degree in Printed Textile Design. During her time there she won the Eileen Bendall and the Sanderson prizes for drawing, and the Daler Rowney Young Artist award – for pastels exhibited in the Mall Galleries – two years running. Each of Vanessa’s still lifes observes the simple beauty of everyday objects – a moment captured in time. 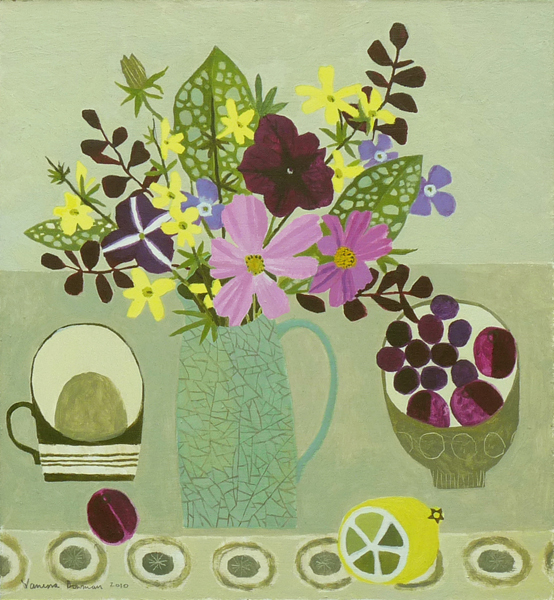 A vase of garden flowers, a bowl of lemons (their acid yellow placed against the deep magenta plum), a striped shell – each is placed deliberately within the framework of the painting combining muted subtle colour with jewel-like accents. Similarly her landscapes observe the pattern and texture of the countryside around her home. She paints features left by the working of the land, punctuated by seasonal land marks – such as skeletons of trees in winter or hedgerow flowers in summer. Detailed foregrounds of vibrantly coloured berries or hips, delicate snowdrops or cow parsley lead the eye into an intimate portrait of the Dorset landscape. “That placing of exhilirating, singing colour is no piece of whimsy..